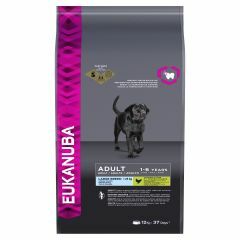 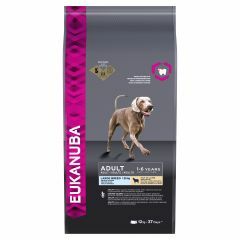 Eukanuba Adult Dog Food for Large Breeds provides the optimal daily amount of protein, carbohydrates, fibres, vitamins and minerals for the health and well-being of your dog. 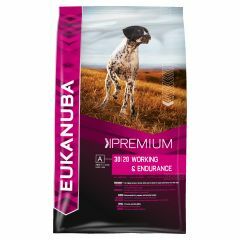 Eukanuba Adult Large Breed Dog with Lamb & Rice Dry Food is premium nutrition specially formulated for large breed dogs with sensitive skin and stomachs. 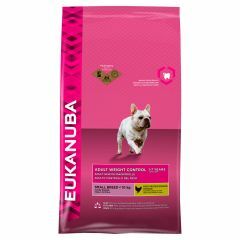 Easy to digest ingredients, prebiotics and beet pulp keep your dog's digestion active and healthy. 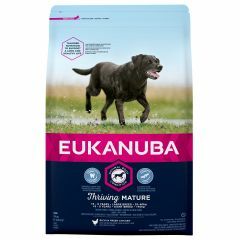 Eukanuba Adult Medium Breed Dog with Chicken Dry Food provides the optimal daily amount of protein, calcium, omega-6 and omega-3 and important nutrients for the health and well-being of your dog. 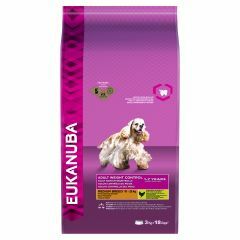 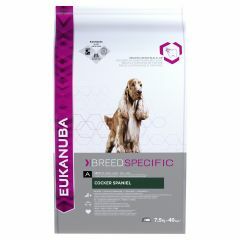 Eukanuba Cocker Spaniel is a complete and balanced daily food designed to help manage weight, promote healthy skin and a luxurious coat. 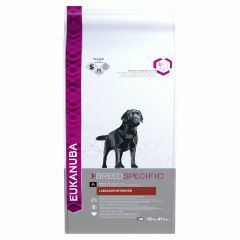 Eukanuba Breed Specific Labrador Retriever Adult Dog with Chicken Dry is a complete and balanced daily food designed to keep the joints healthy and help to control their weight for overall good health. 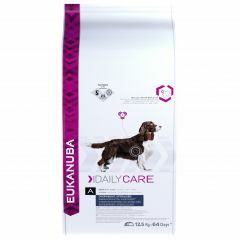 Eukanuba Daily Care Overweight/Sterilised Adult Dog with Chicken Dry Food offers daily Care for Overweight, Sterilised Dogs and is a complete and balanced everyday diet for sterilised dogs that includes the essential vitamins and minerals your dog needs. 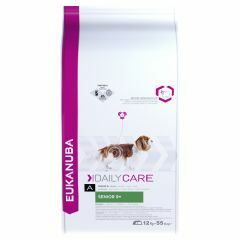 Eukanuba Daily Care Senior 9+ Dog with Chicken Dry Food is a complete and balanced everyday diet for your dog's age related predispositions. 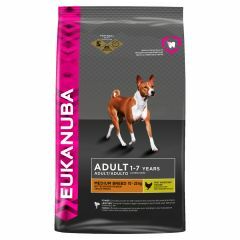 It is specially designed for dogs over the age of 9 years. Eukanuba Daily Care Sensitive Digestion Adult Dog with Chicken Dry Food is a complete and balanced everyday diet for dogs with sensitive digestion and includes the essential vitamins and minerals your dog needs. 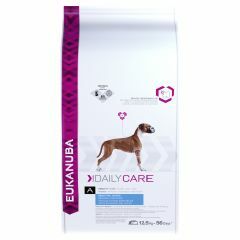 Eukanuba Daily Care Sensitive Joints Adult Dog with Chicken Dry Food is a complete and balanced everyday diet for dogs with a predisposition to stiff joints. 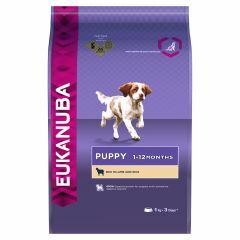 As small breed puppies burn more calories and need more energy per kg of bodyweight than larger breed puppies Eukanuba Puppy Small Breed with Chicken Dry Food delivers the optimal levels of protein, fat and carbohydrates to meet that need. 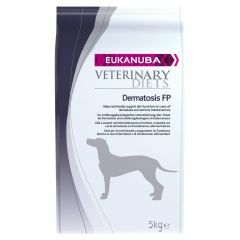 Eukanuba Veterinary Diets Dermatosis FP Adult Dog with Fish & Potato Dry is formulated to meet the needs of dogs suffering from both food allergies and other inflammatory skin diseases. 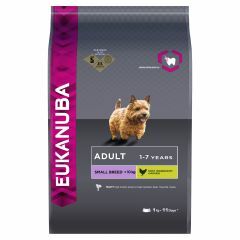 Eukanuba Veterinary Diets Intestinal Adult Dog with Chicken Dry is formulated to help the nutritional management of Intestinal problems in dogs. 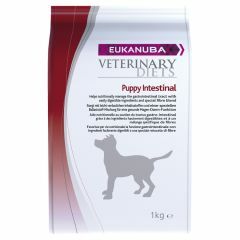 Loose stools can have many causes but in 3 days, you can start to soothe your dogs digestive sensitivities. 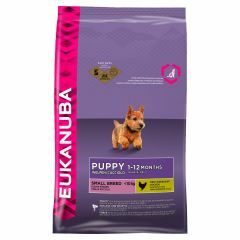 Eukanuba Veterinary Diets Intestinal Puppy with Chicken Dry Food is formulated to help the nutritional management of Intestinal problems in dogs. 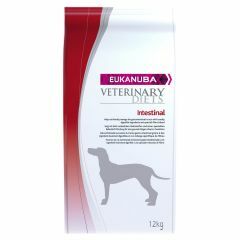 Loose stools can have many causes but in 3 days, you can start to soothe your dogs digestive sensitivities. 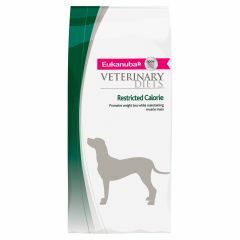 Eukanuba Veterinary Diets Restricted Calorie Adult Dog with Chicken Dry is a complete and balanced dry food to encourage weight loss for overweight dogs.